I love the team of people who come out every year to run contests, greet golfers, haul water and generally cheer on the play. I love watching my kids and my friend’s kids learn that there is no better fun than helping others. 9. Nifty T-Shirts and Signs and Awards. I love the fact we run a quality tournament and that its all donated or underwritten by sponsors. I love Anderson Signs for their annual donation of our signage. I love Liberty Bible Church for massive quantities of printing and advertising and t-shirts. I love my company for paper and pencils and staples and such. I love Woodin’ You for beautiful awards. All of those donations means more for kids. Weekends in Sun River. Fishing Trips. Rounds of Golf. Massage. Raffle and Contests and its all donated. Closest to the Pin. Happy Gilmore. Long Drive. We have a great time. 18 holes at Camas Meadows Golf Course. Best Ball Scramble. Throws and String and all the bells and whistles. You can’t golf? Its a Scramble people – just for fun – grab a ringer and come out! Oh My Goodness. I love Peace Health Wound Healing and Hyperbaric Medicine Center. I love Tri-Tech Heating and Cooling. I love Les Schwab Tire Centers. Wade Au at State Farm. Simple Lawns. O’Ryan Industries. Bonnie Irwin at Real Living. Stan Berkey at Northwest Funding Group. The Holt Group. Rush Process. 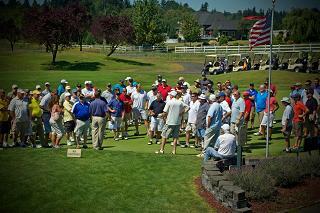 And the 100 other hole sponsors and prize sponsors and raffle donors. You inspire me. I love watching a church partner with a whole pile of local businesses and individuals to help vulnerable kids. Community together. It’s what is right about our world. I love that this year proceeds from the Scramble for the Kids are going to help purchase gym equipment for the new facility at Open House Ministries. There is something so right about a day of golf that helps homeless kids play ball. Fun can heal. 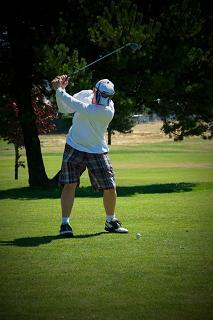 Proceeds from this year’s tournament will help foster kids here in Clark County with back to school fees. So golfers will help foster kids play fall sports. Or rent band instruments. Buy new shoes. I really love golf. This beautiful child was the first baby born at the Ndengera Clinic in Gisenyi, Rwanda. She was born last night. She is why I love golf. For the past 8 years the Scramble for the Kids has provided support to the Ndengera Clinic, Ndengera School, clean water well and general support to at risk children in Rwanda. This baby girl had a safe place to come into the world because of golf. It really does not get better than that. So sign up. Come golf. Donate. Never been a better reason to golf. Or ten reasons. So if you are wondering where I’ve been for the last two weeks and why in the world I’ve been a neglectful blog parent I’ll have to answer with a four letter word. My company is the lead sponsor for a charity golf tournament. 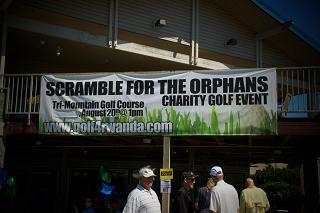 The Scramble for the Orphans benefits the Ndengera Foundation in Gisenyi, Rwanda. The proceeds have been used to build classrooms, dig a clean water well, outfit a medical clinic and generally make life better for lots of kids. I’m the tournament director. This is not as impressive as it sounds. It mostly means that annually, I lose all my pride and any sense of balance in my life. I spend at least a month begging everyone I know and many people I do not know to sponsor holes, donate prizes, agree to volunteer or come out and golf. It means my family and friends come through and do an enormous amount of work. It means my office becomes a storage unit for golf balls, raffle prizes, sponsor bling and mulligan fun packs. It means that every August I’m overwhelmed by people’s generosity, by their compassion and creativity and by how God can make up the difference when I drop the ball. I have a little secret for you. I’ve been on a golf course exactly three times. Year one, two and three of the Scramble for the Orphans. Three years ago I knew nothing about golf. I still haven’t ever swung a club. I’ve learned a lot though about the game. Here’s the three most important things I know about running a successful tournament. 1. Hungry golfers are not happy golfers. 2. Thirsty golfers are not happy golfers. 3. Happy golfers donate more money than unhappy golfers. Saturday was the big day and it was also the hottest day of the year. We went through twelve cases of water for 100 golfers and 20 or so volunteers. A pile of little girls got together with the help of a very dedicated mother and ran a lemonade stand at the tee box of hole 15. They blew through five bags of ice. The senior group at our church made cookies. The favorites appeared to be the chocolate chip coconut. I’m not a coconut fan but I ate several peanut butter cookies and one or two (okay maybe three) rice crispie treats. A very impressive golfer almost won a new car. The same guy had a shot at a million dollars. It’s hard to get a hole in one from one hundred and sixty-five yards. He missed. If he’d made it I would have shamelessly asked for a donation. Fair warning to next year’s winner. Someone with the lucky raffle ticket number went home with a five hundred dollar gift card to a local spa. I almost tripped her on the way out and stole the card. This probably would not have helped with the public relations for next year’s tournament so I resisted. It looked like people had a good time. I sure did. This morning my mom and I cleaned out my office. We recycled leftover brochures and random wrappers. We put back all the office supplies I pilfered on Friday to outfit the tournament. We put together a box of supplies for next year. I made a list of the final details; tax receipts and thank you’s. Then my favorite part; we counted the money and backed out the expenses. I know it, the fact that accounting is my favorite part just proves I’m a nerd. I won’t know a final number for a week or so, there are always donations and receipts that straggle in. I can tell you though that we came in this year right around $12,000. This should pay for the final project on our to do list; a Talapia fish farm. I’m still grinning. It turns out I love golf.